Netflix has come out in favor of some sort of government intervention when it comes to ISPs that charge content providers for capacity at the edge of their networks, claiming Thursday that it should be a network neutrality issue. The internet video provider recently paid Comcast for direct access to the Comcast network after a prolonged negotiation that led to customers getting a crappy Netflix experience during prime time hours. However, despite coming to an agreement, Netflix isn’t ready to throw in the towel on the issue of ISPs seeking to charge content companies such as Netflix and Google — as well as transit providers like Level 3 and XO Communications — to connect their networks. While it seems like one unified whole, the internet as we know it is a series of interconnecting networks, and for content such as streaming videos to traverse these networks, capacity must be available. If there isn’t enough capacity between networks, it is akin to trying to send 10,000 people through a single door. The traffic slows down and people get cranky. In many cases, the owners of networks agree to open more doors for the traffic to flow through, and they do it for free or based on a casual agreement about whose turn it is to buy the servers. But as video traffic is growing and the economic incentive to control the distribution of such video is growing, ISPs have started to charge for opening new doors. But because ISPs have a conflict of interest (they sell paid TV products) and because there isn’t really much Netflix or another online provider can do except pay, the ISPs could be able to grab some control and revenue over the distribution of online video by charging companies for adding capacity at interconnection points. And now Netflix is joining Level 3 is asking the FCC to look at this practice as something that violates the spirit of network neutrality. Without strong net neutrality, big ISPs can demand potentially escalating fees for the interconnection required to deliver high quality service. The big ISPs can make these demands — driving up costs and prices for everyone else — because of their market position. For any given U.S. household, there is often only one or two choices for getting high-speed Internet* access and that’s unlikely to change. Furthermore, Internet access is often bundled with other services making it challenging to switch ISPs. It is this lack of consumer choice that leads to the need for strong net neutrality. That lack of choice is why many consumers, content providers and others argue that strong network neutrality rules are so important. The FCC devised formal rules in 2010 that prevented ISPs from discriminating between different types of traffic on their networks to prevent blocking of competitive services and also to stop ISPs from charging content providers for preferential treatment. However, a court earlier this year vacated most of those rules, leading the FCC to return to the drawing board on this issue. The agency had informally asked for comments related to network neutrality by this Friday. Some big ISPs are extracting a toll because they can — they effectively control access to millions of consumers and are willing to sacrifice the interests of their own customers to press Netflix and others to pay. Though they have the scale and power to do this, they should realize it is in their long term interest to back strong net neutrality. While in the short term Netflix will in cases reluctantly pay large ISPs to ensure a high quality member experience, we will continue to fight for the Internet the world needs and deserves. Comcast on the other hand, is having none of it. 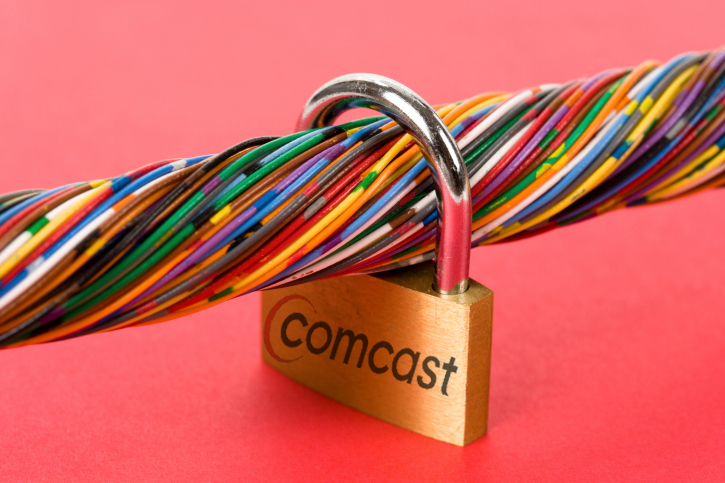 In a statement attributed to David L. Cohen, Executive vice President of Comcast Corporation, the company emphasizes that it a strong supporter of network neutrality, plus it is also the only ISP that is still bound by those rules in the wake of the court decision. That’s because Comcast signed on to abide by those rules as part of the conditions associated with its purchase of NBC Universal. The Comcast statement also conveniently forgets to mention that its behavior of blocking BitTorrent packets back in 2008 led to some of the urgency around formally codifying net neutrality regulations. So in essence, Netflix is trying to get the FCC to use Comcast as an impetus for stronger network neutrality rules once again. This time to ensure that the issue of interconnection agreements gets the FCC scrutiny it deserves. Netflix scaled to where it is due to the scale of others in the internet. And lately it’s been the engine scaling others. That’s the virtuous aspect of the system. By silo-ing Netflix’ traffic onto their own mid-mile and pushing the WAN/MAN demarc closer to the core and away from the edge, the last mile access providers are actually creating negative network effects and capacity inefficiency on 2 fronts. Surprised smart folks like Dan Rayburn http://bit.ly/1mloqAT miss the forest for the trees. At first glance their “technical” arguments are sound, but step back and they make no sense whatsoever long-term; economically or business model. Moreover, the interconnect problem gets worse with 2-way and rural areas, or where-ever traffic density trails off or latency becomes an issue. The amount of inefficient tromboning or hairpinning of IP sessions will explode and latency will rise. What regulators should push for with both IP transition and net neutrality (because they are related) is interconnection closer to the edge to support more efficient a) content storage and distribution distribution, b) growth in hybrid enterprise solutions, c) cloud radio and wireless access, and d) service provider SDN/NFV architectures. These trends will drive the marginal cost of bandwidth down; just like in KC with google fiber. Running the Internet isn’t free. Netflix could build their own and let’s see how neutral things would remain. Since they don’t understand what it means to be a isp, it’s easier to attack than work out a reasonable agreement. PLEASE..Peering is not the Web. Peering is not the Web. Peering is not the Web. Peering is A PHYSICAL LAYER network ( fiber, copper…) interconnection, “wire to wire”. The web protocols are virtual and “ride on top” of whatever type physical layer ( fiber, copper, Radio Frequency(mobile), free air optics…) available at that moment. The Web is not the physical part of the InterNet-work. Peering is PHYSICAL layer INTERCONNECTION. This is the choke point, not the robustly competitive upper Web layer. There is robust global competition above the physical layer. However, at the physical layer interconnection to US residences there is, at best, duopoly I often outright monopoly at this physical layer ( ATT, Verizon, TW, Comcast). Is this clearer? It’s the next physical connection/ interconnection that is the where the Cogents, level3s are being strangled and limited. This confusion between physical layer and “the Web” will result in either continuation of the further monopolization of the physical layer ( Comcast merger with TW, T-Mobile with ???) or continuing confusion of the two among the “chattering classes) resulting in “the Web” along with every other protocol ( NNTP) becoming REGULATED !! It makes it sound like Comcast is feeding us some mistruths with the “everyone’s been paying for 20 years” comment. The bulk of the mistruths are coming from Netflix, actually. How do you figure Mark when I as and end user pay cable ISP’s a substantial monthly fee for unfettered Web access? Peering just ensures a growing profit base for the cable companies that is a pure conflict of interest when they decide to compete with content! This is bundled channel viewing all over again. Comcast’s content will never be throttled, where their competitors will be if they dont pay! ISP’s need to be designated as dumb pipe utilities so we can get the FCC to level the delivery playing field that has so wonderfully worked up until now!